A passionate, proactive and driven individual with hands-on experience in Customer Service. Faten started her career in the F&B industry, then decided to embark on a new journey of customer service in the Medical field. Throughout her efforts, dedication and five years of experience, she developed her Customer Orientation, Communication Skills and Organizational Powers. Faten joined Tamayyaz in 2017 as a Learning & Development and HR Coordinator. She has been contributing in the design, development and delivery of solutions presented to clients in the L&D – with a main focus on Customer Service workshops – and the HR consultancy – by executing Recruitment & Selection Projects, Job Evaluation and Job Grading Processes and developing customized Job Descriptions, Employee Handbook as well as Policies and Procedures. 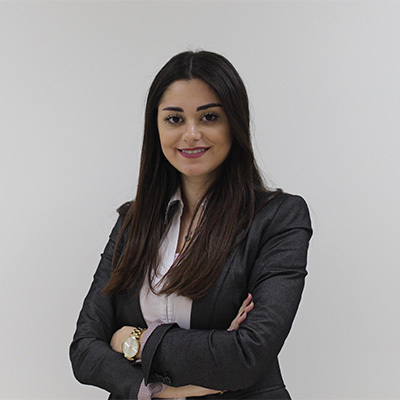 As of 2018, Faten started working as an Account Manager. She has proven to be a positive asset by using her skills to identify customers needs and providing them with best-fit solutions through her coordination with the Learning & Development Department. She has been developing and maintaining strong and trustworthy relationships with individual and corporate clients. Also, Faten has been successfully meeting with existing and new clients to present Tamayyaz Services and generate new opportunities. Faten is a reliable, dedicated, hard worker who contributes to Tamayyaz success.